What if you're the perfect person for the job? Our podcast, The Whole Point, will be coming out soon. It’s been a really interesting process to share ideas and talk into a microphone, with the idea that people will actually want to hear what I have to say. I’ve had to work through wondering if people actually will want to listen. I’m learning the truth about all of this, that yes people will want to listen. Not because I’m super cool. I’m not! But because we humans are created to connect and I have gifts and helpful info to share. I also have some wisdom because you get that from doing stupid things and I’ve done lots of stupid things!! Side note along these lines- when you’re recording a podcast, don’t say “ya” a million times while your co-host is talking. They’re really hard to edit out!! So if you’re in the same space, where you know you’re here to show up and be seen, and a little unsure about that, I have a few tips as you keep reading. If you’ve got a call on your life to do something great, and you have enough faith to believe that you can do it. You know something bigger than you is leading you to more. If you’ve been wondering if being you is good enough, I have some good news. YES!!! A million times yes. It’s OK to be you. Totally and thoroughly you. Isn’t that crazy? I love it! Are you called to sing, or act, or write a book? Are you called to lead a group, or start a business? Are you called to talk about your passion with people? Is your big desire to make people laugh, or hold space for healing? Do you believe that you purpose on this planet is to help people get physically healthy? Do you dream of creating art that connects people in amazing ways? Do you know you’re called to give to orphans or be the best mom for your kids so they can grow and change the world? Then I want you to know something. That call is NOT a mistake. Your personality is perfect. Your weirdness is perfect. Your face is perfect. When Marisa Peer shares her message all over the world that we need to tell ourselves everyday “I am Enough” this is what she’s talking about. Here are a few things I’ve been learning as Christy Bartelt and I have sat down and recorded episodes for the podcast and I’ve been writing to you each week in this blog. It’s not about me! Or you! If I spend all my time worrying about how cool I look or funny I am, I miss the point that I’m here to help people heal. There are hurting people I need to reach and if it’s all about how perfect I am, I miss that. Work on loving yourself. The only way to make it not about you is to do your best everyday to accept yourself! We need to accept ourselves. Every part, your strengths, and your weaknesses. Your faults are your superpowers! I am the type of person that jumps in with both feet and asks questions later. I’m getting better, this is a fault. But it’s lead me into SO MANY situations where I can now sit with people with zero judgment because I’ve probably been there done that. You are enough!! Not only that but you are uniquely situated on the planet right now for such a time as this, to effect change and make the world a better place. You. Yes, you. Write this somewhere where you can see it often. Your mess is your message. I know you’ve heard this a million times, but here it is again. That thing that you went through- or are going through right now, just may be the exact thing that you use to help tons of people. I spent years in anxiety and insecurity, feeling worthless. Through healing myself, I discovered Rapid Transformational Therapy and now I get to use it everyday to help people! There are people who need what you have. Most importantly, like the first point, is that there are people that need to hear your message. They need to connect with your business, your service, your art, your talent. There are people who are waiting for you to impact their life. So to end this post, I’m going to share one of my favorite quotes. 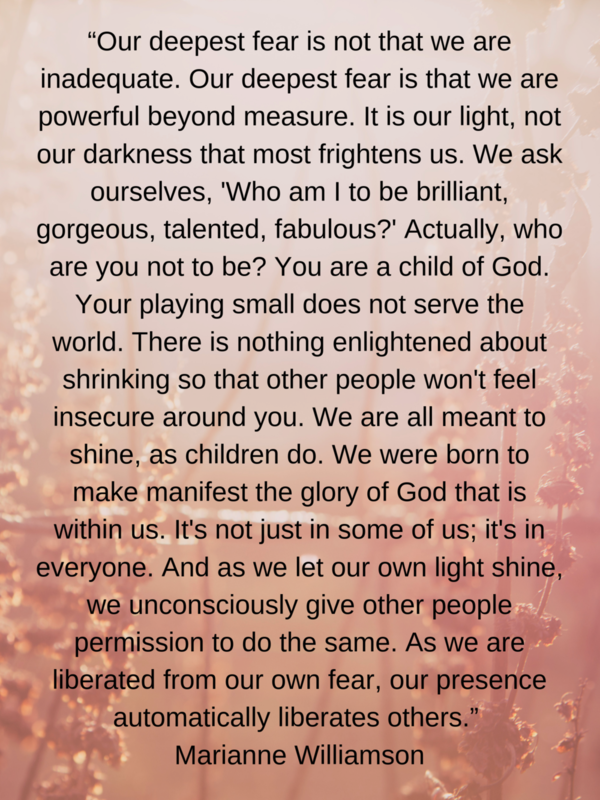 From Marianne Williamson, that Nelson Mandela shared years ago. I’m sure you’ve heard it, but it’s good to see again!! You got this! If you’re in the middle of a mess, don’t hesitate to ask for help! Check out www.cyrinatalbott.com to see if RTT is right for you. And if you’d like to be part of our email community of many others who are stepping out and being brave and showing up, click here.